“You are a newborn, a wrinkled girl confined to your crib, the high chair, the stroller.” Thus begins “Living Arrangements,” the first story in Laura Maylene Walter’s debut collection of pensive short fiction. “Living Arrangements” draws you into the narrator’s world as only a second-person voice can: Feeling directly addressed, the reader is forced to empathize. Walter’s collection is sprinkled with more pieces in the second-person and each time they resonate. These short, emotional snapshots are successful because of their stately progressions and spare, but never anemic, language. 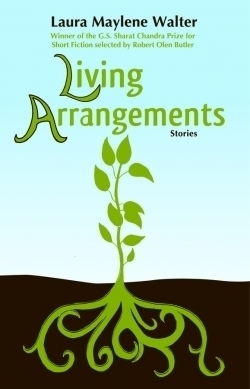 While “Living Arrangements” guides the reader through an entire lifetime of memories, other stories take him into specific, sharp moments of existence. “The Ballad Solemn of Lady Malena” presents a predator and his measured pursuit of his underage obsession: “‘Keep it light,’ he told himself. Never mind that her body was right there and he could reach out and put a palm on her thigh.” Possibly the most shocking story in the collection, “The Ballad” offers, in its own supremely dark message, a final shred of redemption. That it comes from the voice of a stalker is possibly the most disturbing part of all. Walter’s tight collection of stories ranges from the point of view of the child to the adult, from the man to the woman. Sometimes her stories are beautiful; often they are full of the ludicrousness of life. Mature readers who prefer literary to commercial fiction will enjoy delving into this writer’s psyche. A young writer who has already accumulated several awards for her short fiction, Walter is sure to be on the scene with her first novel soon. We can look forward to it being incredible and moving—a thing, perhaps, like this collection: not just of beauty, but of the beauty in ugliness.